The Destin, Panama City Beach & greater Pensacola area offers an array of special attractions that may not fit into traditional attraction categories. In this section you may find things to do that you might not have thought of or attractions that just defy description. 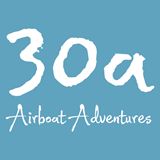 30A Airboat Adventures… A Whole New Experience! Are you ready for a thrilling ride gliding through the pristine back waters of South Walton? Experience some of Mother Nature's most serene landscape and beautiful wildlife. See a side of Florida most people don't even know exists.Conveniently located between Panama City Beach and Destin.